Do you see what Delgado is trying to do? She, like so many on the right, thinks that if she can call into question Roof’s race, then it will partially obfuscate the fact that the crime was one of race, was a terrorist incident against black people, and allow her to cling to the belief that we live in a post-racial America where everyone is equal. In other words, she wants to dump a big pile of bullcrap into the social media ether and try to pretend that nothing is as it seems. 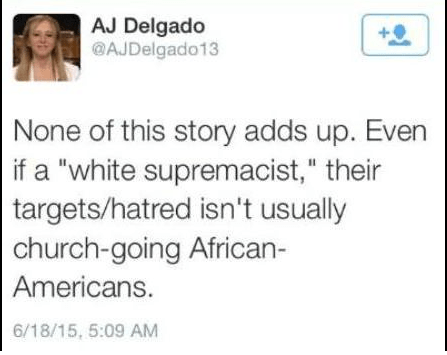 She wants to join the Fox News ninnies in their attempt to paint Dylann Roof’s actions as anti-Christian instead of anti-black. I have one word to describe A.J. Delgado: Disgusting! You mean it doesn’t add up in your antiquated view of the world. Ms. Delgado? The world where all is well and no one white ever kills a black person for being black? If that’s the case, then perhaps you should join the rest of us here in the 21st century and face reality. Yes, Michelle, all of the pain and mourning in America over this heinous crime will indeed pass, and we will heal as a country. But what will not pass is the fact that you and your fellow jerkweed A.J. Delgado will forever will be known as two of the most insensitive and unfeeling people to ever be placed upon the earth. This entry was posted in Uncategorized and tagged Gun Tragedies, Guns in America, Ignorance in the Media. Bookmark the permalink.